The idea of losing weight is generally associated with following a strict and limited diet. People tend to focus on the foods that they cannot eat and may not see the benefits of keeping a healthy and balanced diet. However, eating healthy is a great way of having more energy and improving your daily mood. Moreover, these meals are not only rich in nutrients and vitamins, but are also very delicious. Fruits are a great idea for a snack between meals, for eating after hitting the gym or when wanting to enjoy a healthy dessert. They are a good choice for a satiating snack with a fresh and delicious taste. In order to enjoy all the benefits, it is essential to eat fresh fruits and not canned ones. The latter ones can contain additional sugar and syrups. In addition, there are a few fruits that can help you lose weight and burn belly fat. Here are 5 products which you need to add in your diet and can bring you great benefits. Avocado is known as the most nutritious fruit and it also occupies a top position in the category of fruits that burn fat. The fact that this fruits is rich in omega 9 fatty acids is just one reason why avocado is good for your body. These fatty acids are monounsaturated fats and play an important role in helping you lose weight. Consuming avocado can boost your metabolism and help your body convert fat into energy at a higher rate. This can give you a great sensation and make you feel full of energy. What is great about avocado is that it can be eaten at breakfast with toast, combined with other vegetables for salads or used to give a special flavor to other foods. For instance, avocado mayo is a great alternative for egg mayo. Blueberries are rich in antioxidants and help you boost your metabolism. This can give your body a great help in burning calories. Furthermore, they are a great option for a healthy dessert and a good way of strengthening your immune system, as they contain a good amount of Vitamin C.
Whether it is consumed as a juice or eaten at the breakfast, grapefruit is a great fruit for several reasons. First of all, it contains fat burning enzymes which help you in the process of losing weight. The body consumes a great amount of energy in order to digest it, which makes you burn a higher number of calories. Secondly, it maintains your body hydrated and gives you a feeling of satiation. Sticking in the category of citrus fruits, lemons are the next fruits that can help you in losing weight and burning fat. Have you ever seen supermodels drink water with a slice of lemon in it? There is a good reason for that. Lemons have detoxifying properties and help you get rid of the bad substances from your body. They can help you maintain a healthy liver, the organ responsible for digesting food and burning fat. A good digestion means a healthy and balanced lifestyle. Pomegranates are not only a great option for a sweet snack, but they are also an excellent combination between antioxidants, vitamin C and vitamin K. They are a great help for boosting your metabolism and eliminating the toxins from your body. In addition, these fruits can easily satiate your appetite. For this reason, drinking a glass of pomegranate juice before having a meal is a good option for losing weight, as they can help you eat less. 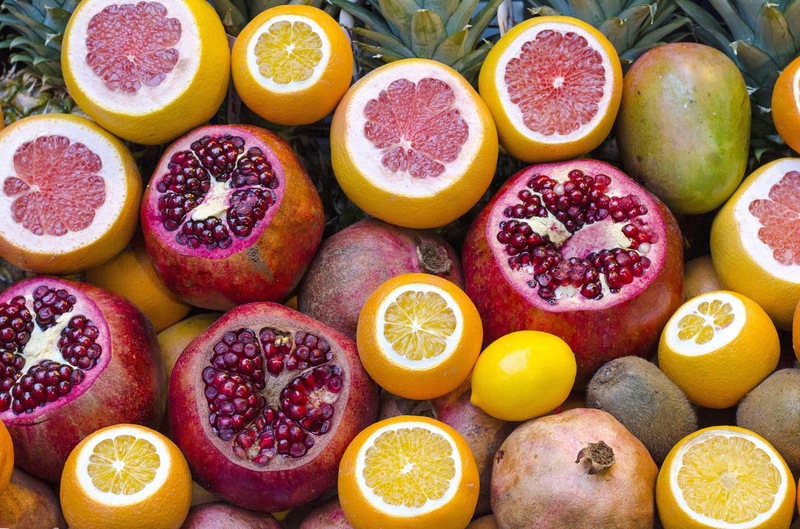 Just adding these fruits into your daily diet can have a positive impact on your entire body. From boosting your metabolism to giving you more energy for your daily activities, fruits are a must have in any healthy diet. Consumed in a moderated measure, they can help you burn fat and obtain the results you want. GreenProduct is a blog that promotes a healthy lifestyle and eco-friendly products.